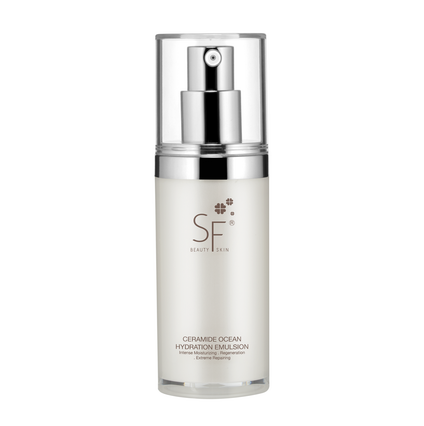 SF all new “Deep Ocean Water Series” is mixed with deep ocean water, chemical free, ideal for all skin type. Focusing on the beginning of life and the key of long-lasting beauty, cellular health, “Deep Ocean Water Series” can revitalize the cell, enhance cell metabolism and self-repair, reduce visible signs of aging. “Deep Ocean Water Series” is the product for the skin of your dream, natural, instant effect and over time, for every woman, no matter your age and skin type. Ceramide Ocean Hydration Emulsion combines natural powers for the cellular energy in addition to intense moisturizing. This silky-soft cream comforts dehydrated skin and restores vitality, enhances skin’s own repair system, aging is no longer exist. Apply product on face and neck area, every morning and night. Massage gently to stimulate absorption.